This is really different than anything else I’ve used before. For those of you who don’t know what Matcha is – it’s green tea, but not like the kind in a tea bag, or loose leaf as it were. It’s powder that’s ground up from the green tea leaves. Hence it’s very Kermit green hue. This also means you consume the entire leaf providing your body and mind with a maximum concentration of Polyphenols and EGCG. The difference between Matcha and brewed green tea? UP TO 137x THE ANTIOXIDANTS! I have a confession to make. The only blender I’ve ever had in my home has been a cheap $15 one that we actually picked up to do a homeschool science experiment a number of years ago. I never really felt that I needed one before, until I started making smoothies, iced coffee drinks, shakes and the like. Only to find out that cheap blenders just don’t do well with the cups of ice. At least not in a short amount of time and not without that smell of thinking that the motor is going to burn up on you. Bethenny Frankel is the four-time bestselling author of Skinnydipping, A Place of Yes, Naturally Thin, and The Skinnygirl Dish. She is the creator of the Skinnygirl brand—which extends to cocktails, fitness, and health and focuses on practical solutions for women. Her newest book, SKINNYGIRL COCKTAILS: 100 Fun & Flirty Guilt-Free Recipes (Touchstone Paperback; October 28, 2014; $15.00) is full of amazingly delicious guilt-free 150-calorie cocktails and recipes for any fun-filled party. 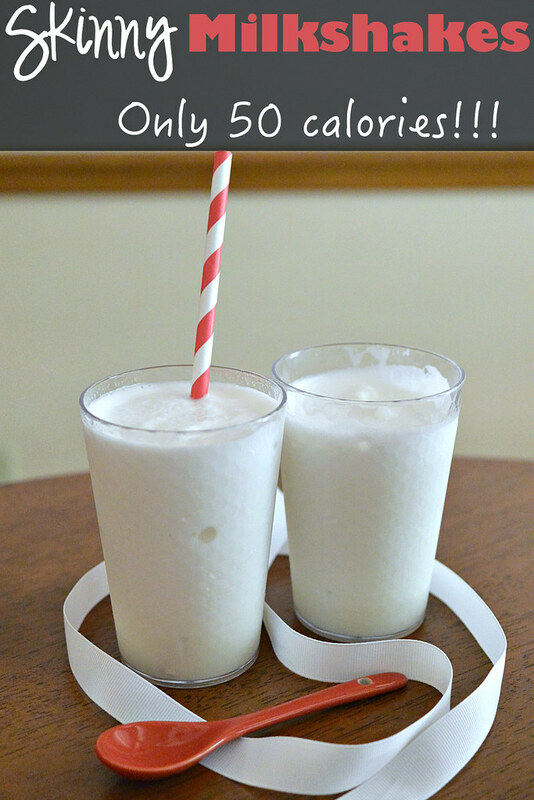 Skinny Milkshakes – Only 50 Calories!! The temperatures have once again skyrocketed here in North Texas. And we’re doing everything we can to cool down. With a few trips on the horizon next month, I’m trying to not eat too many calories these days as I know I’m going to blow the calorie counts when I’m traveling. Did you know what the average 8 oz milkshake has in terms of calories? 256. Yikes! But I love them. VitaFrute™ Cocktails by VEEV® are the ultimate summer drinks for your summer picnics, BBQs and parties. VitaFrute is definitely a better way to celebrate because VitaFrute Cocktails helps you #PartyOrganically. VitaFrute’s Cocktails are USDA certified organic, made from all-natural and premium ingredients and have a low-calorie makeup with under 125 calories per serving. That makes them the perfect drinks to serve at all your summer occasions. Post Pebbles cereal is great tasting on its own for breakfast or a snack with milk or without . But there are plenty of recipes that you can use it in too! With everything from whoopie pies to smoothies, the colorful and crunchy Pebbles you already love are brought to life in some new creations from celebrity chef, Kristina Vanni. These recipes are great for entertaining or just to get your little helper in the kitchen for a fun day together! Here is a tasty creation from Chef Vanni that is perfect for an afternoon snack – especially on a hot summer day! I’m still coming to terms with the fact that October is almost over – seriously how did November creep up on us so fast?! I am glad for the cooler weather though, the HOT Texas summer was a bit more intensive than I had anticipated 🙂 And with the cooler weather that means that holiday baking is already commencing in my kitchen, and I had the opportunity to make a few things (and share them!) with Werther’s Original Baking Caramels. It’s been a long time since we’ve done any kind of Halloween Celebrations around our home, but I’m always up for creating – and so when I had the opportunity to come up with some ‘Spooky’ Halloween Recipes using 7Up, Hawaiian Punch and M&M’s, I was up for the challenge. It’s that time of the year. We aren’t ready for summer to end, but we’re heading into autumn. This is a great smoothie recipe that I got from a Family Fun magazine that combines the sweetness of summer peaches with the warm flavors of fall. The best of both! Mangoes were on sale at the store last week for 48¢, and I had just gotten a package delivered with some Lung Ching Dragonwell green tea from The Coffee Bean & Tea Leaf thanks to a Klout perk. So when I was flipping through my August issue of Woman’s Day and saw Joy Bauer’s Energy Smoothie recipe, featuring green tea and mango, well I knew I had to make it.